The CDA 3S10WH spherical designer extractor is a stylish statement piece for any kitchen. The remote control allows easy and practical function. It comes with many features such as: 2 neon lights for bright, clear illumination, 10 minute timer, 4 different extraction speeds and a dishwashable aluminium grease filter. The CDA ECHK90SS is an excellent focal point of any kitchen island. This chimney island extractor descends from the ceiling with a striking design. The extractor has 3 speeds and push button control with 2 LED lamps to provide optimum illumination. 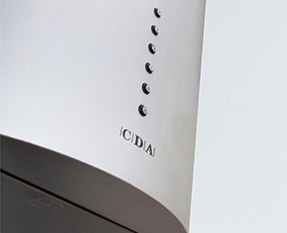 The CDA EVPK90SS is a contemporary stainless steel island extractor with 3 speeds plus an intensive speed. The EVPK90SS has a touch control panel, as well as a filter saturation warning light that makes maintenance hassle free. This extractor has a clean air function keeping your kitchen smelling fresh. It also has a 15 minute timer allowing the extractor to switch off automatically after cooking. The EKPK90SS is a stylish curved glass island extractor with LED edge lighting in three colours, blue, red and green. It has 3 speeds, touch control and built in LED lights to provide good illumination of the cooking area. The EZTK90BL Designer T-shape extractor is part of the DKR range. This extractor is not only stunning, it also boasts many great features such as touch control, timer function, low noise levels, high extraction rates and is B rated for energy efficiency. This extractor has an ultra-modern look with a crisp LED strip light to provide good illumination of the cooking area, whilst ensuring an odour free kitchen in no time. If you are cooking at an island unit then you will need an extractor that can be installed and suspended from the ceiling area directly above your hob. 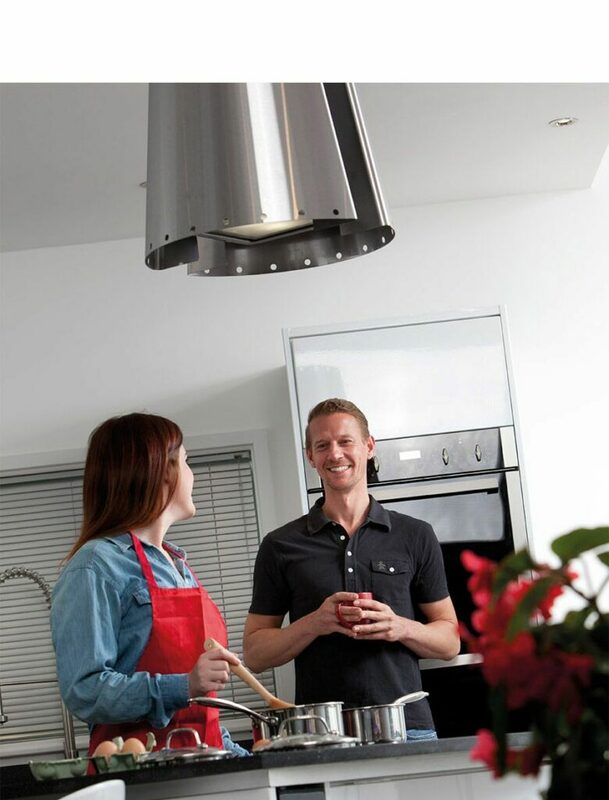 Island cooker hoods offer ceiling installation in a more traditional chimney design that comes with a flat steel extraction area, a glass canopy or even as a unique statement piece like our EVCK cylinder extractor range. The kitchen island is possibly the most popular design feature in this busy part of the family home at the moment. Whether you have bar stools for eating at it or your cooking appliances installed in it, it allows the cook to interact and engage with the rest of the family while preparing meals. As well as looking fantastic in a standout colour or usefully housing taps, wine coolers, cookers and hobs, your kitchen island has to be practical. It is all good and well cooking on an island but you do need to think about the extraction method. Depending on your lighting design, you may need extra illumination over where you cook. With an island extractor you can switch on bright halogen lighting right where you need it and enjoy cooking in the centre of your favourite room. With grease, steam and cooking smells escaping from your hob, an open window isn’t going to cut it. Dirt will quickly settle on unwanted surfaces, utensils and cookbooks in an open plan kitchen while smells will be difficult to remove once they have ingrained themselves in cushions and soft furnishings. The problem comes with wall mounted extractors being inefficiently located to cope with the immediate needs of the hob during cooking. An island extractor however can be mounted from the ceiling, allowing you to position it directly over your cooking workstation. As well as extracting efficiently and cleaning your kitchen air effectively, an island extractor makes a real statement and feature of your preferred layout. We have designs similar to our wall mounted chimney range as well as more unusual options for the design-led customer. This range is flexible in installation with the option to either fit ducting to expel air to the outside or use charcoal filters to recirculate cleaned air back into the kitchen. You can click on your chosen product to be taken through to the specification page. This is where you will find the appropriate product code for your ducting or for charcoal filters. Both of these you can order through your retailer. Replacement filters are always available by telephoning our Head Office to order. No matter the design, the performance is guaranteed to leave your kitchen smelling fresh and all our models have been designed with easy maintenance in mind. You will find all of our functions and features in the range, from multiple extraction speeds to more technical aids like peripheral aspiration and timers. For a full guide and explanation of our extractor features, visit the buying advice centre for jargon-busting descriptions and practical hints and tips to help you get the most out of your CDA kitchen.